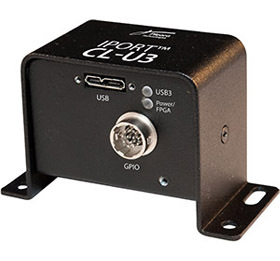 Pleora’s iPORT™ CL-U3 External Frame Grabbers provide systems manufacturers and integrators with cost and design flexibility advantages by converting Camera Link® cameras into native USB3 Vision™ cameras. With these external frame grabbers, Camera Link cameras can transport high-speed imaging and video data over the widely available USB 3.0 bus. The cameras can also be used with a broader selection of smaller form factor, low-power computing platforms to help reduce system costs.